Elizabethan Hair StylesElizabethan Hair Styles for the court were led by Queen Elizabeth. Upper class fashion, which included hairstyles, was highly elaborate - and necessary to achieve attention and success at court. It was referred to as the Peacock age as the Upper class Elizabethan men were often more elaborately dressed than the women and their hair and beards received a similar amount of attention! 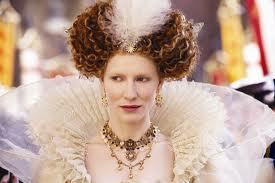 Elizabethan Hair ColorIt was important for Queen Elizabeth to maintain her image and the beauty of a 'Virgin Queen'. The Elizabethan view of ideal beauty was a woman with light hair and a snow white complexion complimented with red cheeks and red lips. Queen Elizabeth achieved this picture of ideal beauty by using white make-up. This explains the odd white face make-up seen in many of her portraits. Queen Elizabeth had a natural red color hair. This red hair look was emulated by many of the nobility of the Elizabethan era, as was the fair hair ideal of an ideal woman! An Upper Class Elizabethan woman followed this fashion further and might even dye her hair yellow with a mixture of saffron, cumin seed, celandine and oil! Wigs were also commonly used - Queen Elizabeth had a wide variety of wigs and hair pieces - believed to number over eighty! These were often referred to as Periwigs. Elizabethan Hair Styles for WomenElizabethan Hair Styles for women were designed to compliment the upper class fashions of the day. Ruffs, or ruffles, were in high fashion and during the Elizabethan era these became more elaborate and were constructed on gauze wings which were raised at the back of the head. 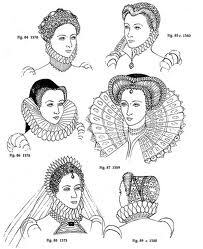 The ruffs, or collars, framed the face and dictated the hairstyles of the age which were generally short for men ( at the beginning of the Elizabethan era) and swept up look was required for women. 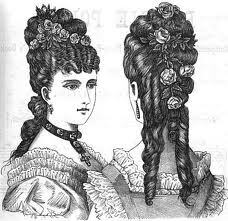 A frizzy hairstyle was also one of the required styles for women! Women kept their hair long and the full natural beauty of their long hair was displayed by the young women of the era. The long hair flowing hair of a young girl was a sign of a virgin and the favoured hairstyle for a bride on her wedding day. An Elizabethan bride would adorn her hair with fresh flowers. Once a woman achieved the married status she wore her hair swept up. Much of the hair was covered by some form of head covering. Long hair was generally dressed in a bun to which the variety of head coverings could be pinned. The front and sides of the hair received great attention as this was the area that was most displayed. Fringes were not in fashion - hairstyle fashion dictated that hair was combed way from the forehead. The hairstyle was usually designed to compliment the style of the hat. Frizzed hair was favoured by the Queen and therefore followed by ladies of the court although straight hair was favoured with a centre parting which especially complimented the french hood. The Caul - Cauls were the Elizabethan hair net! A Caul covered the hair at the back of the head and was made of fabric, or fabric covered by netted cord which was sometimes adorned with spangles. "Then followeth the trimming and tricking of their heds in laying out their hair to the show, which of force must be curled, frizled and crisped, laid out on wreathes & borders from one eare to an other. And lest it should fall down, it is underpropped with forks, wyres, & I can not tel what, rather like grim stern monsters, than chaste christian matrones. Then on the edges of their bolstered heir (for it standeth crested round about their frontiers, & hanging over their faces like pendices or vails with glasse windows on every side) there is layd great wreathes of gold and silver, curiously wrought & cunningly applied to the temples of their heads. And for feare of lacking any thing to set foorth their pride withal, at their heyre, thus wreathed and crested, are hanged bugles, ouches, rings, gold, silver, glasses , & such other gewgawes and trinckets besides, which, for that they be innumerable, and I unskilfull in wemens terms, I cannot easily recount." Elizabethan Hair Styles for MenElizabethan Hair Styles for men were just as important as they were for women. The length of hair varied during the Elizabethan era. It started as short closely cropped hairstyles and increased in length during the period. Considerable time was spent grooming the hair, especially when it was fashionable to sport a longer length. Long hair was required to be curly! Men had their hair curled with hot irons. To keep the hair in place wax or gum was applied to the hair! "...have invented such strange fashions and monstrous maners of cuttings, trimmings, shavings and washings, that you would wonder to see. They have one maner of cut called the French cut, another the Spanish cut, one the Dutch cut, another the Italian, one the newe cut, another the old, one of the bravado fashion, another of the meane fashion. One a gentlemans cut, another the common cut, one cut of the court, an other of the country..."
"if a man have a lean and straight face, a Marquess Otton’s cut will make it broad and large; if it be platter-like, a long, slender beard will make it seem the narrower; if he be weasel-becked, then much hair left on the cheeks will make the owner look big like a bowdled hen, and as grim as a goose, if Cornelis of Chelmersford say true. Many old men do wear no beards at all."